The hotel industry is inherently vulnerable to modern slavery due to the nature of the industry, the web of business relationships connected with each hotel and the consequent needs of each hotel, such as the need for a wide array of reasonably priced services, its seasonality, and labour supply. With the rise of modern slavery and supply chain transparency laws, the hotel industry can no longer look the other way and continue to operate without any accountability. This guide sets out practical solutions aimed at ensuring that a franchisee’s operations have the relevant safeguards in place to prevent human trafficking, forced labour and other forms of exploitation. The Vietnamese government has made significant progress to reinforce the current legal system on combating trafficking, particularly in regulating and criminalising trafficking in the Penal Code. The amendments related to money laundering and corruption under the Penal Code also demonstrate Vietnam's commitment to take a more holistic approach to combating human traffikcing. While some amendments are in positive direction, trafficking in persons and its concerning activities are scattered in widespread offences and the legal system could benefit from consolidating related offences under a single piece of anti-trafficking legislation. The absence of the non-criminalisation provision is also problematic and limits victims' access to justice. This report on anti-trafficking, anti-money laundering and anti-corruption laws in Malaysia is the third report in the series of legal gap analysis of anti-trafficking legislations in Southeast Asia. There have been significant developments in the policy and legal framework in Malaysia but significant gaps remain in the protection and access to justice mechanisms for victims of trafficking and other forms of exploitation particularly the vast majority of exploited foreign migrant workers who are employed across the formal and informal work force in difference sectors. This White Paper, a collaboration between Liberty Asia and Clifford Chance, looks at normative and legislative trends taken to address modern slavery ranging from the global to the national and state level. The paper also analyzes the impact of the current legislations on corporate disclosure and transparency and discusses how a patchwork of diverse legislations which differs from jurisdiction to jurisdiction in scope and application, and across different industries should lead to a development of a global standard. The adoption of the ASEAN Convention Against Trafficking in Persons, Especially Women and Children (ACTIP), the first legally-binding instrument to tackle human trafficking in the region, is monumental and provides a legal framework for more coordinated action across the ASEAN Member States. This report summarizes the most important ACTIP provisions, compares ACTIP with ASEAN members' domestic legislation and the European Convention, and sets out recommendations for a monitoring and enforcement framework. The Code of Conduct is an attempt to set minimum standard for investigative NGOs operating in Southeast Asia. It seeks to set and uphold professional standards for the protection of victims of trafficking, NGO personnel, the integrity of the criminal justice process and the reputation of all parties in the sector. Liberty Asia has partnered with DLA Piper to release a white paper evaluating Social Risk as part of complying with Environmental, Social, and Governance requirements. This paper examines some of the reasons behind the increased profile of social risk issues in the business world, including: the increased investor demand for socially responsible companies; a continued crack down on forced labour by legal and regulatory enforcement regimes; and lobbying by global frameworks, NGOs, and nonprofi ts for social risk reform. This paper also examines and evaluates some of the steps taken to combat social risk issues in Hong Kong and the Asia-Pacific region more generally, and finally proposes reforms to better address these social risk issues. The Legal Gap Analysis of Thailand's anti-trafficking legislation seeks to offer a comprehensive insight into various areas of local law that are relevant to combating human trafficking and modern slavery including how these laws fare with respect to Thailand's commitments or obligations under international conventions and agreements. Anti-money laundering and anti-corruption provisions that are relevant to human trafficking are also examined in detail. The Thailand Legal Gap Analysis is a collaboration between Liberty Asia, Linklaters and MAST, with consultation from several agencies from both the public sector and civil society. It is offered to all stakeholders in Thailand counter-trafficking movement as part of a constructive conversation on the way forward. A Thai translation of the analysis is available here. This piece of research, a collaboration between Liberty Asia and Clifford Chance, sets out high-level findings in respect of anti-money laundering legislation and the requirements for the reporting of suspicious activity in relation to human trafficking in 18 jurisdictions. The research highlights variations in approaches to defining human trafficking as a predicate offense to money laundering between Asia, North America and Europe. The policy report analyzes the current anti-trafficking regimes as it relates to children trafficked to and within Thailand and its implementation and efficacy in practice, based on research conducted with local NGOs who work with child victims in Thailand. The report also sets out the tension between the immigration regime and child protection regimes when it comes to unaccompanied foreign migrant children, as well as tension between international and domestic law on the treatment of vulnerable children and the requirement to consider and act in their best interests. The policy report makes high-level recommendations based on best practice anti-trafficking measures identified in the UK and US. A Thai translation of the policy overview is available here. This Briefing Paper examines recent amendments to the Section 307 of the Tariff Act of 1930 and its application in the context of human trafficking prevention. The paper specifically discusses how the Trade Facilitation and Trade Enforcement Act of 2015 expanded the Tariff Act’s potential to serve as a tool to deter and punish human trafficking. The guideline is intended to provide best practice and principles for the anti-trafficking sector to create awareness and teach about how and when images can be used. It is an effort to offer advice on how to ensure that the dignity and rights of victims and of those we are working to protect are respected. The document is a practical toolkit for everyone in the anti-trafficking sector and includes in its Annex a Proposed Form of Consent Letter, a Checklist of Key Guidelines, and an overview of the legal background. 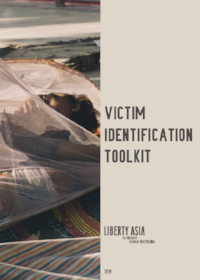 The 2016 version of the Victim Identification Toolkit has been updated to reflect new statistics, trends and developments in Hong Kong based on the U.S. Department of State's Trafficking in Persons Report 2015. Furthermore, in light of recent labour violations case and the ongoing judicial review related to the government's failure to enact human trafficking laws in Hong Kong, the 2016 version also updates the "Government Response to Human Trafficking" section. Useful resources tailored for each actor involved in the victim identification process are added to Section 4 to assist front line responders. New checklists are included in Section 5 to provide additional interview techniques. In addition, Section 7 which lists out support service providers in Hong Kong is updated to provide up to date information, contact details and available services. A briefing paper for companies on the Modern Slavery Act. Summary of the UK Modern Slavery Act 2015 and its implications on corporates and NGOs and activists. The Legal Gap Analysis of Hong Kong's anti-trafficking legislation seeks to offer a comprehensive insight into various areas of local law that are relevant to combating human traffikcing and modern slavery including how these laws fare with respect to Hong Kong's commitments or obligations under international conventions and agreements. Anti-money laundering and anti-corruption provisions that are relevant to human trafficking are also discussed. Data protection is often an overlooked issue in organisations that are constantly firefighting and supporting very vulnerable people with very limited resources. These Guidelines will clarify the protections available in the law and assist NGOs with protecting sensitive data to better serve their clients and, ultimately, strengthen the fight against slavery. The paper examines the Criminal and Law Enforcement Injuries Compensation ("CLEIC") scheme which is available to provide compensation to victims of violent crimes in Hong Kong but inaccessible to victims of human trafficking. It then discusses how a state funded compensation scheme can provide one of the most accessible avenues for victims of trafficking seeking compensation. The report highlights the range of offenses that can occur in a trafficking situation, such as assault, sexual violence, employment and immigration law breaches to enable more prosecutions and combat the culture of impunity for the traffickers and offenders. The aim of this report is to allow front-line NGOs engaged in legal service provision and lawyers representing victims of trafficking to get ceative about the way they pursue traffickers hence improving their chances of securing justice for victims. This report provides a comprehensive overview of various civil remedies available under Hong Kong Law and comments on their applicability to trafficking victims. Remedies in contract, tort and pursuant to the Basic Law together with the eligibility criteria and judicial procedure(s) for each remedy are examined. A joint briefing between Justice Centre and Liberty Asia examining modern day slavery in Hong Kong and offering policy solutions provides clarity about the distinguishing features and overlaps between forced labour and human trafficking, with reference to international standards. It goes on to identify the gaps in existing legislation, which is currently failing to provide redress in cases of trafficking for forced labour and to prevent further abuses, is neglecting to prosecute traffickers and is not offering adequate protection to victims of trafficking for forced labour in the HKSAR territory.